WASHINGTON -- Jubilation over the recent birth of panda twins at the National Zoo turned to sadness Wednesday as one of the newborn cubs died after three and a half days. The zoo's panda mom Mei Xiang gave birth to the first cub Saturday at 5:35 p.m. and a second cub about five hours later. Had both cubs survived, they would have been the 17-year-old panda's third and fourth surviving offspring. The remaining cub, the larger of the two, appears to be strong, robust and behaving normally, the zoo said. The surviving cub remains with its mother. Veterinarians did not immediately announce the cause of the smaller cub's death but said they would perform a necropsy, the equivalent of a human autopsy. "This is a hard loss for us," said zoo Director Dennis Kelly during a press conference at the zoo. "It's really hard to keep these creatures thriving." Nothing was obviously wrong with the cub that died, and the zoo doesn't know if it was born with problems, said Associate Director for Animal Care Sciences Brandie Smith. Despite its small size, the cub was still in the normal size range for cubs that have survived, she said. "Right now we still have a very healthy mom and one very healthy baby," Smith said. Mei Xiang has two other surviving offspring. The first, Tai Shan, was born in 2005. Her second cub, Bao Bao, turned 2-years-old on Sunday. This isn't the first time that Mei Xiang has lost a cub. She gave birth to a stillborn cub in 2013, the same year she gave birth to Bao Bao. And in 2012, Mei Xiang gave birth to a cub that died after just six days. Its lungs hadn't fully developed. Zookeepers had been trying to care for the twin cubs using a technique developed by Chinese breeders. Because pandas won't usually nurse twins if left to their own devices, breeders have adopted a practice where every several hours they swap the cubs, giving each one time with its mother. The zoo said Tuesday afternoon, however, that Mei Xiang had gone almost 24 hours without allowing them to swap the cubs. As a result, animal keepers were taking a hands-on approach to caring for the smaller cub. Don Neiffer, the zoo's chief veterinarian, said the zoo was prepared for twins and for using the swapping technique. "We did know that would come with its own set of challenges," he said. Caretakers had been concerned about the smaller cub's fluctuating weight. Animal keepers were feeding the cub using both a bottle and a tube. The zoo said the cub had "shown some signs" of regurgitating the liquids it was being fed, which could lead to the cub inhaling liquid into its lungs. Veterinarians gave the cub antibiotics to prevent a possible infection, the zoo said. Caretakers were able to give the smaller cub to Mei Xiang around 2 p.m. Tuesday and retrieved it from her Wednesday morning. That's when keepers became concerned because the cub had not gained weight, appeared weaker and exhibited possible respiratory issues, the zoo said. Neiffer, the veterinarian, said Mei Xiang never showed any signs she was concerned about the smaller cub. The zoo had cautioned that both cubs were in a "high-risk period" in the days after being born. Kelly, the zoo director, called it a "very fragile time." 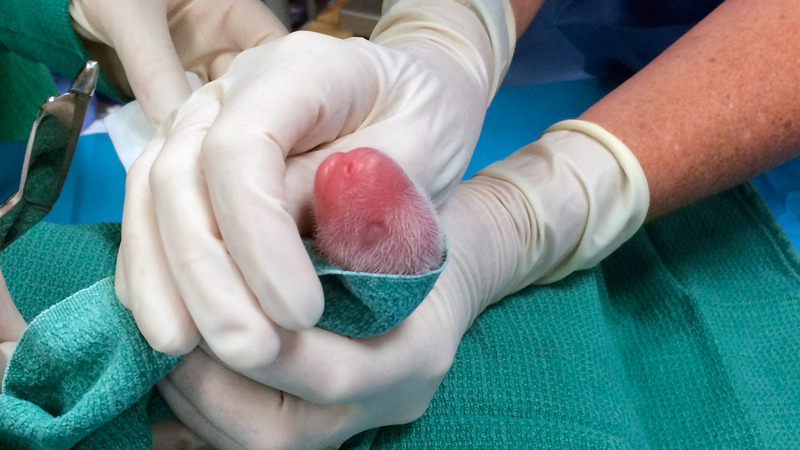 Pink, hairless and blind, newborn cubs weigh three to five ounces. Panda mom Mei Xiang weighs more than 700 times as much. The zoo said the mortality rate for pandas in their first year in human care is 26 percent for males and 20 percent for females. The zoo has not said whether the cub that died was male or female. Neither cub had yet been given a name. The National Zoo is one of only four zoos nationwide to have pandas, which are on loan from China. The zoo's first pair of pandas, Ling-Ling and Hsing-Hsing, were a gift from China following President Richard Nixon's historic 1972 visit to the country. The pair had five cubs while living at the zoo but none survived. The zoo's current pandas, Mei Xiang and Tian Tian, the parents of both Bao Bao and Tai Shan, arrived in 2000. The pandas belong to China as do any cubs they have. The pair's first cub, Tai Shan, returned to China in 2010. Their second cub, Bao Bao, still lives at the National Zoo.